USS Alchiba (AKA-6) was an Arcturus-class attack cargo ship named after Alchiba, a star in the constellation Corvus. After two years as a merchant ship, she served as a commissioned warship for 4 years and 7 months in 1941-1946. Commissioned as (AK-23), Alchiba was redesignated (AKA-6) seven months later. She won three battle stars for her World War II service, and was awarded a Presidential Unit Citation for her service at Guadalcanal from August through December 1942. Laid down as Mormacdove under a Maritime Commission contract (MC hull 21) on 15 August 1938 at Chester, Pa., by the Sun Shipbuilding & Drydock Co.; launched on 6 July 1939; sponsored by Miss Alice W. Clement; owned by operated by the Moore-McCormack Lines; acquired by the Navy on 2 June 1941; renamed Alchiba the next day and simultaneously designated AK-23; converted by the Boston Navy Yard for naval service as a cargo ship; and placed in commission at Boston on 15 June 1941, Commander Allen P. Mullinix in command. Alchiba was assigned to the Naval Transportation Service and sailed to Charleston, S.C., for shakedown training. She then carried out training exercises along the east coast through early October and sailed—via Quonset Point, R.I.—for Halifax, Nova Scotia, to take on cargo and personnel for transportation to Iceland. She departed Halifax on 22 October and reached Reykjavík, Iceland, on 30 November. The vessel discharged cargo there before sailing back to the United States. She reached New York City on 26 December, was briefly drydocked there for repairs. Alchiba got underway again on 11 January 1942. She arrived at Charleston—via Norfolk, Va.—on the 19th, took on supplies and equipment destined for the Pacific theater, and set sail on 27 January. She transited the Panama Canal on 2 February; joined the Base Force, Pacific Fleet; and continued on to the Society Islands. Alchiba reached Bora Bora on the 17th and began discharging her cargo. She departed that port on 14 March and shaped a course for Chile. She reached Antofagasta, Chile, on 29 March and took on a load of ingot and electrolytic copper. After transiting the Panama Canal on 8 April, the cargo ship arrived back in New York City on 19 April and unloaded her cargo. The vessel was assigned to Amphibious Force, Pacific Fleet, and became a member of Transport Division 10. On 22 July, she sailed for Korp Island, Fiji Islands, to participate in amphibious landing exercises—the rehearsal for the first American assault landing in the Pacific theater. Upon completing this training, she embarked marines and filled her holds with ammunition, amphibious tractors, gasoline, and general supplies and got underway for operations in the Solomon Islands. The vessel arrived off Guadalcanal on 7 August, disembarked her troops, unloaded her cargo, and left the Solomons two days later, bound for New Caledonia. After her arrival at Noumea on the 13th, the ship loaded on more cargo and, nine days later, commenced a voyage which took her to Pago Pago, American Samoa; Tongatabu, Tonga Islands; and Espiritu Santo, New Hebrides. Alchiba returned to Guadalcanal on 18 September. After unloading cargo to support Marines struggling for that island, she sailed back to New Caledonia for more supplies and returned to Guadalcanal on 1 November. During November the ship shuttled supplies and personnel between Guadalcanal and Tulagi. She was anchored off Lunga Point at 0616 on 28 November, when two torpedoes from the Japanese submarine 1-16 exploded on the vessel's port side. At that time, her hold was loaded with drums of gasoline and ammunition, and the resulting explosion shot flames 150 feet in the air. The commanding officer, James Shepherd Freeman, ordered the ship to get underway to run her up on the beach. This action undoubtedly saved the ship. Hungry flames raged in the ship for over five days before weary fire fighting parties finally brought them under control. Salvage operations began soon thereafter. Most of her cargo was saved, and temporary repairs were in progress when Alchiba was torpedoed again on 7 December. An enemy submarine's conning tower had been spotted shortly before two torpedoes were fired. One passed close under the cargo ship's stern, but the other struck ner port side near the engine room. The blast killed three men, wounded six others, and caused considerable structural damage. Once the fires and flooding were controlled, salvage operations resumed and enabled the ship to get underway for Tulagi on 27 December 1942. Alchiba remained at Tulagi through 18 January 1943. On that day, she was moved to Espiritu Santo for further repair work. While at that island, the ship was redesignated AKA-6 on 1 February. She left Espiritu Santo on 6 May, bound for the west coast of the United States, and entered the Mare Island Navy Yard, Vallejo, Calif., on 2 June. Her refurbishing there lasted until early August when she conducted sea trials off the California coast before sailing on 13 August for Port Hueneme, Calif., to take on cargo. Six days later, she headed for the South Pacific to continue her service providing logistics support for Allied fighting men. She made runs to New Caledonia and Guadalcanal and in mid-November, participated in the landings on Bougainville. 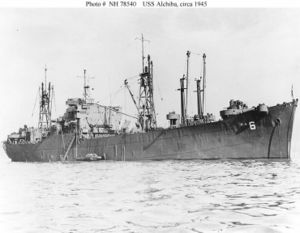 Alchiba continued her supply duties in the Solomon Islands and New Caledonia through late March 1944. On March 25th, the ship began a voyage via Pearl Harbor back to the West Coast of the United States. On 30 May, Alchiba entered the Moore Drydock Co., Oakland, Calif., to undergo extensive alterations and repairs. The work was completed late in August, and the cargo ship got underway for sea trials in San Francisco Bay. Engine trouble developed during these tests, and the ship returned to the yard on 1 September for further repairs. She took on cargo at the Hunters Point Navy Yard on the 22d and sailed once again for Espiritu Santo. While en route, the ship experienced more engine problems, but she reached her destination on 9 October and commenced repair work. This process continued until early November, when the vessel shaped a course back to San Francisco. She arrived at the Mare Island Navy Yard, Vallejo, Calif., on the 29th and underwent extensive repairs to her main engine. On 24 February 1945]], Alchiba commenced sea trials but was forced to return to Mare Island two days later for still more work. Two weeks later, the ship sailed to Morehaven(? ), Calif., to load cargo and got underway on 20 March for Pearl Harbor. During the run to Hawaii, the engines continued to give trouble, and Alchiba returned to San Francisco for further repairs, this time by the General Engineering & Drydock Corp. The cargo ship left the shipyard on 3 June; sailed to the Naval Supply Depot, Oakland, Calif.; took on cargo there; and put to sea on the 15th, bound for Ulithi. While she was en route there, her destination was changed to Pearl Harbor because of still more engine trouble. Upon her arrival at Hawaii on the 24th, repair work was resumed. The ship sailed again on 8 July for Eniwetok, Marshall Islands; Ulithi, Caroline Islands; Guam, Mariana Islands; and Manila, Philippines. When World War II ended in mid-August, Alchiba was in port, at Ulithi. unloading cargo. She remained on duty in the western Pacific through 26 October, when she was ordered back to the United States. Alchiba arrived at San Francisco on 19 November. Eight days later, she began a voyage to the east coast, transited the Panama Canal on 10 December, and sailed for Norfolk where she arrived on the 18th. Preparations for her deactivation then began. The ship was decommissioned at Portsmouth, Va., on 14 January 1946; and her name was struck from the Navy list on 25 February 1946. She was transferred on 19 July 1946 to the Maritime Commission for disposal. She was sold in 1948 and refitted for merchant service. This page was last modified 17:50, 8 June 2009.